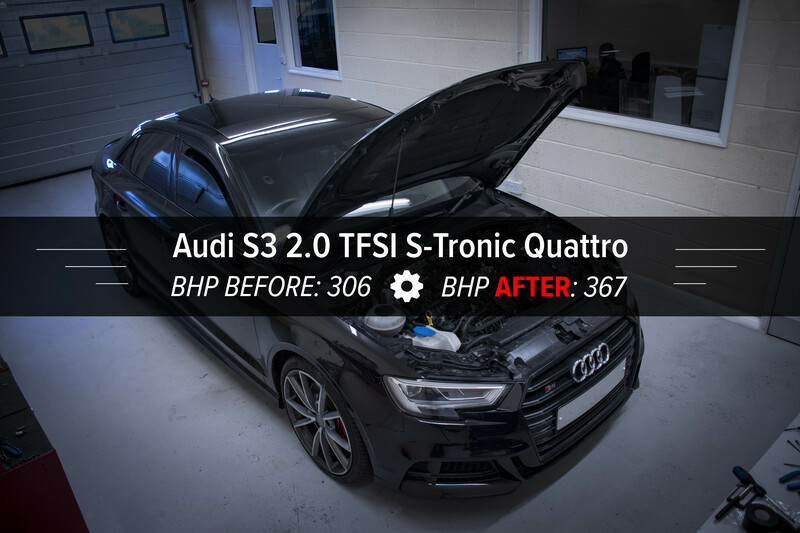 Audi S3 Saloon 2.0 TFSI S-Tronic Quattro With CRTD4 Multi Channel Petrol Tuning System. You are not seeing double! 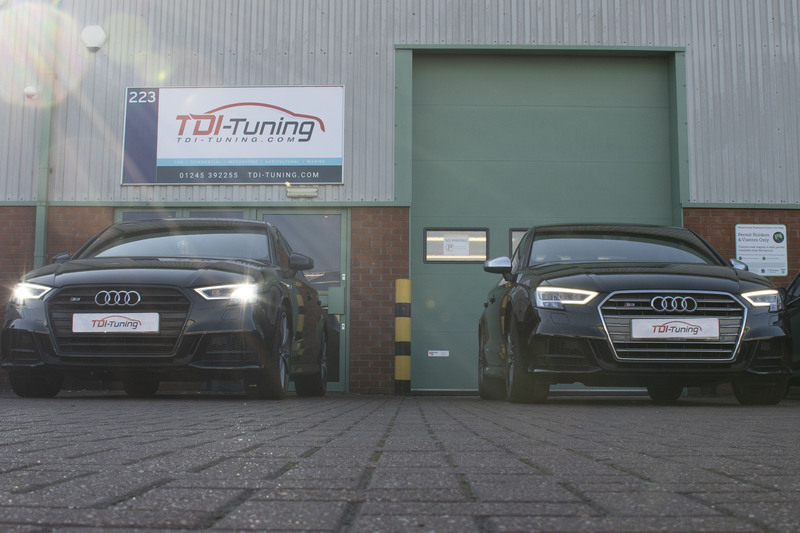 One day this month two Audi S3’s visited the TDI-Tuning HQ. We take a closer look at these aggressive S3’s and unlock the true power potential available from the engines. Two customers, both in the same hypothetical boat: “I do want more power, but I do not want Audi to invalidate my warranty”, TDI-Tuning are able to provide the perfect remedy to this complicated issue. A traceless tune with thousands of hours of technical research and development behind it. Nothing else in the tuning market can match the attention to detail our engineers put into every single hardware and software optimisation. Keep on reading to find out more! Before we begin to talk about the tune, it’s first important to talk about the cars characteristics and quirks. 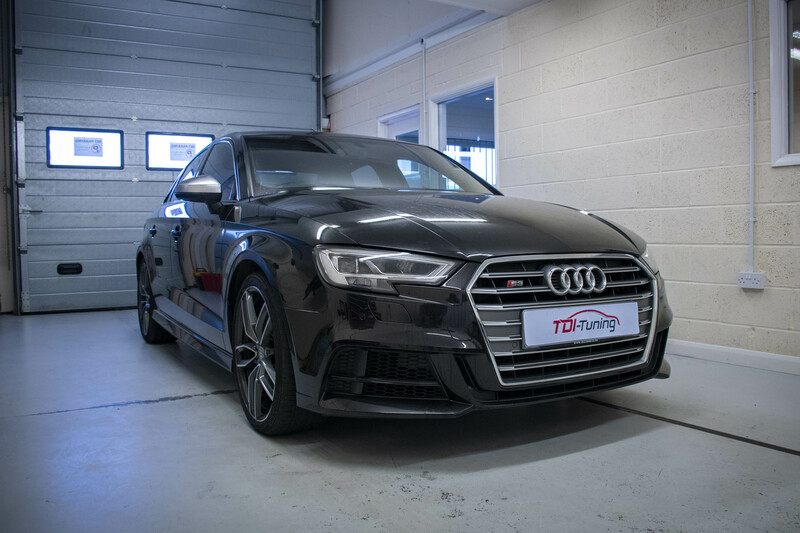 The S3 is an excellent middle ground, performance saloon car. Maintenance and fuel costs are considerably cheaper than buying the RS3 alternative. The S3 doesn't compromise on build quality though, as with most Audi’s the build quality is sublime. We were especially impressed by the amount of seat control available in the S3. It makes finding that perfect driving position a breeze, so you never feel uncomfortable despite the stiff suspension. The media control panel reveals itself out of the dash board gracefully like you're in a spaceship, and all the controls are positioned exactly where you want them. So, the interior is excellent, whats the performance like? The engine in the S3 produces a healthy 306 BHP from a two-litre, turbocharged four cylinder engine. The four wheel drive system works tremendously with the S-Tronic double clutch system. The exhaust makes a tremendous noise when you change up a gear, and the car grips the road well. All in all, it’s a very good car if you don’t want to cane your wallet completely. It offers great performance, pretty styling, and fantastic build quality all wrapped in a compact sports car. It’s a great choice of car in our opinion as it does certainly tick all the boxes. There is always room for improvement though, so we take a deeper look into the engine and the performance. The car is no slouch to begin with but the enhanced power levels are a welcome addition to the S3. With the TDI-Tuning box connected up and powered on the BHP is taken from 306 to 367. A seriously noticeable increase on the road. The owners of these two S3’s were overjoyed with the results. Stating that it had completely transformed the car. The performance is delivered smoothly so it appears as if nothing is out of place. The TDI-Tuning box is completely traceless once removed. No physical or digital trace is ever left behind. This makes it the perfect performance modification if you do not want to tamper with anything in the engine bay. The S3 install was complete with the Bluetooth version of the CRTD4. This means complete control all from the comfort of inside the vehicle. The 7 various map settings can be changed and the tuning box can even be switched off completely to revert the S3 to stock settings. The tuning box enhances performance in a smooth and efficient manner, and two more happy customers left TDI-Tuning with a traceless tune they can trust. The particular system installed on these vehicles connects to two engine sensors to optimise the performance. A simple 15 minuite install to massively increase performance and enjoyment!